Thanks Jane Hindmarch my Kombi buddy for the photo! The sketching season has truly begun. With my Kombisketchtour hat on we recently delivered a workshop for the Wildlife Trust for Bedfordshire, Cambridgeshire and Northamptonshire at the Old Sulehay Nature Reserve. Attendees explored the wildflowers of the season, through walking and taking pitstops to draw. Whilst it was a typical April showers kind of day this did not deter the ardent sketchers, who readily agreed to erecting a marquee so they could continue with their fervent drawing in the pouring rain. This was a great kick start to what makes me feel good: Getting outdoors, connecting with nature and recording the changes in the season through drawing. It was apparent that this is also what the group came looking for - to feel good in nature. 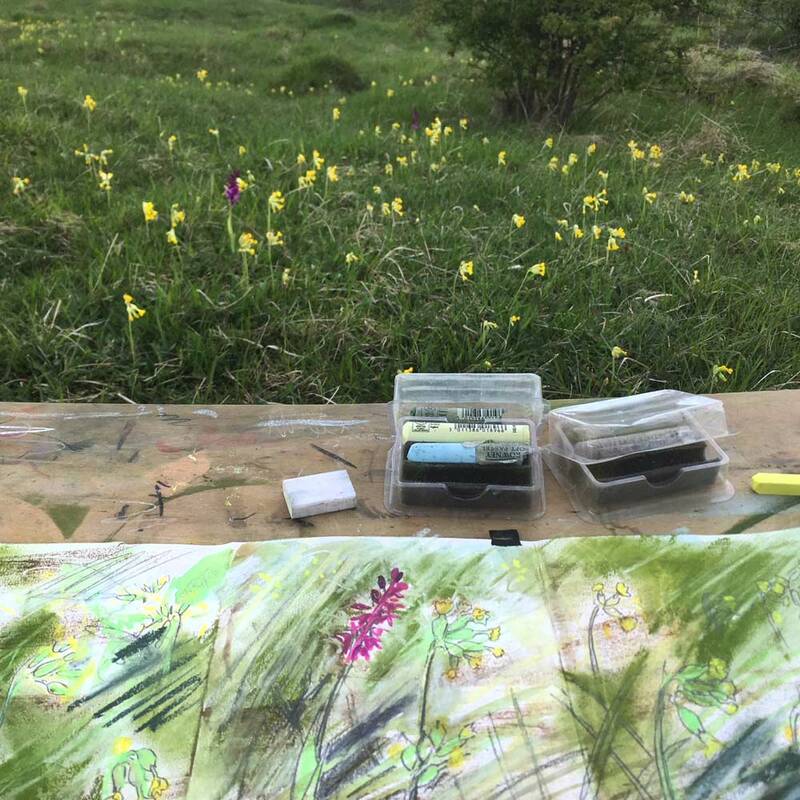 There's been a lot of emphasis on the value and importance of being out in nature, along with increasing evidence to support the benefits of creating art for well being. Many social activities are offered to support folk into good health. A question has been posed as to whether art should be prescribed? For me I would say yes! The two combined activities bring about not only a focus for a busy mind but also a connection with the rhythms of the seasons. This is why I draw. People often stop and comment on how relaxing it must be to sit and draw. This is true and it's also a commitment to well being. Drawing is a discipline - it helps focus the mind through doing a co-odinated activity. Do you sketch? I read recently about a current initiative "Arts On Prescription" a partnership between Health/ Community and the Arts sectors, offering arts activities as part of a care package to support a range of issues including depression and anxiety. This is definitely an area I feel passionate about, having worked in mental health for many years- it's exciting to read about a medicine that marries the two. Having delivered many workshops I can see the tangible benefits to those that attend, evidencing an increase in confidence through the self expression of drawing, folk present more relaxed and they appear to have fun! The perfect elixir for life! If you would like to know more about drawing and workshops please get in touch. Plus hop over to kombisketchtour.com to find out more on Sulehay Nature Reserve and Nature Sketch. A selection of greeting cards coming soon- directly from the sketch board. If you would like to know more please get in touch.